Able to be powered by coin-cell battery for 18–24 months, TDWLB allows pressure of any fluid to be monitored from vacuum to 10,000 psi. BluetoothÂ® Smart-certified device, designed for intermittent machine-control applications, comes in compensated accuracies of 1% and 0.25%; temperature sensing is optional. Able to be controlled with smartphone app from within 150 ft, all-digital product provides redundant sensing and is EMI/RFI protected and sealed to IP67. Powered by coin-cell battery for 18-24 months, new pressure/temperature sensor ideal for A/C refrigerant monitoring, aerospace/marine/industrial applications, home and medical automation. CINCINNATI, Ohio — What's the pressure in that refrigerant line, oil line, water line or gas cylinder...now you can check your cell phone or iPad if you're within 150 feet and you'll know. The new TDWLB pressure/temperature sensor designed by Transducers Direct is the industry's first to be powered with a coin-cell battery, controlled with a smartphone app, and certified as Bluetooth® Smart. Developed for home automation, industrial, marine and commercial applications, the TDWLB uses a patent-pending design and proprietary digital circuitry for high energy efficiency to provide an 18- to 24-month battery life and redundant sensing. Its smart phone app ("T-Direct TDWLB" on iTunes and soon Android) lets the user name each sensor one time securely, then program setpoints/alarms for multiple sensors, monitor readings, and graph activity over time – all from a phone, tablet or computer. The TDWLB is available in two different compensated accuracies of 1 percent and 0.25 percent, with temperature sensing as an option. It is designed for intermittent, rather than dynamic, machine-control applications. "Beta testers of the TDWLB – whether dentists, welders, bar and mall owners, HVAC OEMs or boat owners – have told us this will save time, equipment damage, and wasted money for unneeded service, downtime, premature refills, etc.," said Rob Matthes, President of Transducers Direct. "The pressure of any fluid can be monitored from vacuum to 10,000 psi. A/C contractors can read refrigerant pressures without clumsy gauges, bars can monitor their gas cylinders, homeowners can monitor their own A/C refrigerants, water or swimming pool lines, inspectors can check line pressures remotely. It ends the refrigerant leaks that occur when attaching gauges, so it's EPA friendly. There has never been anything like this, and we'll be announcing expanded capabilities for this platform in coming months." The US-made sensor is all digital, eliminating mechanical components, wear parts, analog circuitry and setpoint drift for ultimate reliability and accuracy. Unique in design, it uses a one-piece, precision-machined stainless steel diaphragm and header. This provides ten times the life of a conventional diaphragm and eliminates all springs, pushrods, micro switches and O-rings. All wetted parts are stainless steel. The TDWLB's all-digital design eliminates amplifiers, filters, and amplified noise, producing a high-resolution signal without analog variability or noise in the circuit. It is easily programmed and monitored through its app. The TDWLB senses pressure by using a time-to-digital converter (TDC) to measure the duration of a capacitive discharge across the changing resistance in a Wheatstone bridge atop the diaphragm. Clever circuitry splits the signal from the bridge, creating a redundant signal that ensures continuous machinery operation if one half should fail. All wetted parts of the TDWLB are stainless steel. The sensor is EMI/RFI protected and sealed to IP-67 rating. 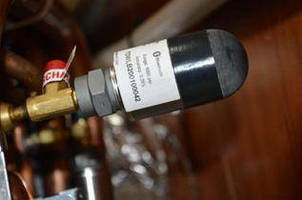 Standard overpressure rating is 2X, with 4X optional. Burst pressure is 5X or 20,000 psi, whichever is less. The TDWLB is available with a variety of industry standard pressure-port connections. Replacement battery packs are available from Transducers Direct. For more information on the TDWLB, see the video at (INSERT web link), visit transducersdirect.com or call 513-583-9491. 1. Incorporates Bluetooth Core Specification Version 4.0 (or higher) with a Low Energy Core Configuration or Basic Rate and Low Energy Combined Core Configuration. 2. Uses the GATT-based architecture to enable a particular functionality of the product. Kemble & Drum Communications Inc.